California Wildfires - What Can We Do Now? California Wildfires – What Can We Do Now? The Golden State has been under siege from devastating wildfires, unlike any they have seen before. At the time of this article 140,000 acres have been consumed due to the Camp Fire just North of Sacramento which is considered only 40% contained. Camp Fire has grown to be the most destructive and deadliest wildfire in California’s history. The Woolsey fire to the south, just north of Los Angeles has caused the loss of 98,362 acres and is about 57% contained. Even more devastating than those numbers are the number of people forced to evacuate, those who are missing, and the confirmed fatalities that have resulted from these terrible fires. Since November 8th, Camp Fire has destroyed over 8,700 residences and 260 commercial structures and evacuation parameters continue to expand. CalFire has created an online interactive evacuation map for citizens impacted by Camp Fire who need help finding the best path to safety. According to Butte county an evacuation center at Bidwell Jr. High School remains open while 6 other evacuation centers are full and no longer able to accept evacuees. Over 100 people remain missing from the areas affected by Camp Fire, a number that is, unfortunately, growing every day. The elderly represent a large portion of those missing, mothers, fathers, and grandparents. In the same timeframe, The Woosley fire has been threatening 57,000 structures and has already destroyed over 500. Three firefighters have been injured and at least 2 civilians have been killed. CalFire currently lists several open shelters for the people impacted by Woosley as well as animal shelters – shelters that will continue to fill up as the fire remains only 57% contained. California Residents are being encouraged to register with Safe & Well, and use the free American Red Cross service to check on loved ones. What Happens to Hospitals, Skilled Nursing Facilities, and other Clinical Sites During These Disasters? In our line of business, we partner with clinical facilities across the country to provide HIPAA-compliant secure messaging and clinical collaboration tools. This has left us wondering – what happens to the hospitals, LTACs, SNFs, and other clinical partners when these disasters are at their front door? While most clinical facilities likely had and executed their disaster preparedness plans as soon as evacuation orders were released, some may have found themselves scrambling in the sudden urgency. Many things have to happen to evacuate a clinical site. Accommodations have to be arranged for each patient, including acceptance by a receiving facility that is appropriately equipped and staffed as well as transportation to that facility. Medications, medical records, equipment, and other clinical necessities need to be evacuated as well whenever possible. All of this care and coordination must happen in an environment that may already be impacted by staff shortages. To top it off, these clinicians still have a duty to protect the privacy of their patient’s protected health information which can make communication more cumbersome in the absence of a secure messaging solution. We at QliqSOFT, Inc. have been asking ourselves, what can WE do to help? We know that communication is key to coordinating these herculean efforts, and when clinical facilities are impacted they need a way to securely manage that communication. That is why, for the next 4 months QliqSOFT is offering 100% free use of our Secure Texting software for any clinical organization impacted by these two fires. Facilities within a 50 mile radius of either Camp Fire or Woolsey Fire, who don’t currently have a secure texting platform, are encouraged to sign up for free accounts by contacting our Customer Success Manager, Jolean Sheffield. QliqSOFT is dedicating resources to supporting the sites in the affected area with their use of secure messaging including account creation and disaster messaging templates, completely free. California and all of the people who call this beautiful state home are heavy on our hearts at this time. If you are able to contribute monetarily to the relief efforts please consider donating to the American Red Cross or a local non-profit such as the California Community Foundation’s Wildfire Relief Fund. 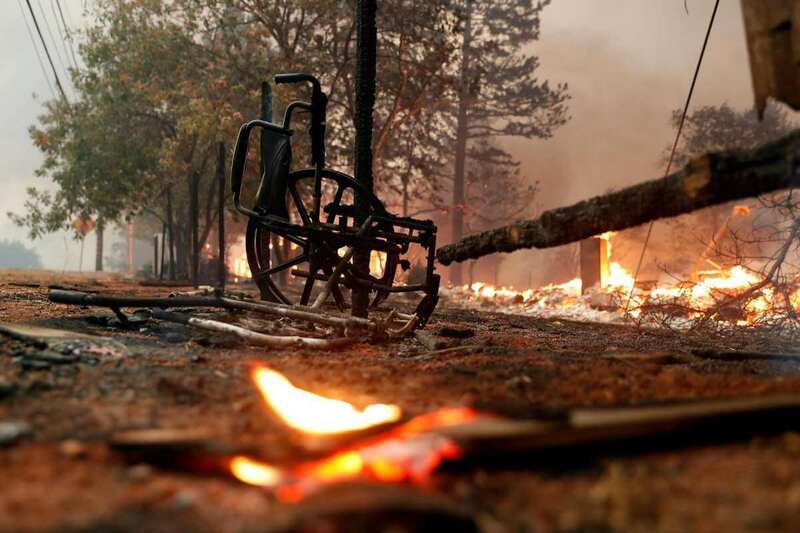 A charred wheelchair in Paradise Gardens senior community during Camp Fire in Paradise, Calif.. on Thursday, November 8, 2018.